Its response to the crisis has, therefore, been primarily an economic one. Its top priority is to reduce youth unemployment, of at least 30% in urban areas. It hopes to do so through promoting industrial parks such as the one in the southern town of Awassa, which opened in 2016. It is Africa’s largest and is expected to provide 60,000 jobs. But even the largest industrial parks are still a drop in an ocean of unemployment. And since most of the jobs they provide are low-skilled, they will do little to help the hundreds of thousands of university graduates entering the job market each year. “I’m a graduate in accounting but I work as a hotel cashier,” laments one exasperated Ambo resident. Alexis de Tocqueville, a 19th-century French historian, argued that the most dangerous time for a bad government is when it begins to reform itself. 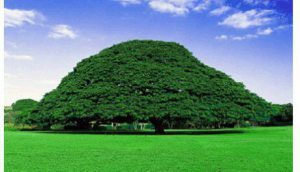 The EPRDF is not the ancien regime of pre-revolutionary France. But it has taken de Tocqueville’s lesson to heart. It views Ethiopia as a house of cards that might easily topple. So the old model persists: development now, democracy later. THE three-hour bus-ride to Ambo from Addis Ababa, Ethiopia’s capital, offers a glimpse into the country’s future. The road is well paved; irrigation ditches and polytunnels criss-cross commercial farmland; electricity lines leap over forested hills. The signal granting access to mobile internet is clear and constant. As the bus pulls into Ambo, a trading centre in Oromia, the largest and most populous of Ethiopia’s nine ethnically based regions, the street is bustling. But there are signs, too, that not all is well. An army truck rolls down the main road. Federal police surround the entrance to the local university. Unemployed young men playing snooker in bar point at a building across the road: it used to be a bank, but it was burnt down. Three years ago 17 local boys were shot dead by security guards as they protested on the doorstep, the young men say. Ambo has a reputation for dissent. It was on these streets that protests against authoritarian rule started in 2014 before sweeping across the country. They culminated in the declaration of a six-month state of emergency on October 9th last year. Students from Ambo University led the charge in opposing a since-shelved plan to expand the capital city into surrounding farmland. Oromo identity is especially powerful here: locals speak angrily about being pushed aside by ethnic Tigrayans, who they say dominate the government despite making up less than 6% of the population. The country’s leading opposition politician, Merera Gudina—who was charged with inciting terrorism in February and was scheduled to appear in the dock on April 24th—comes from this area. 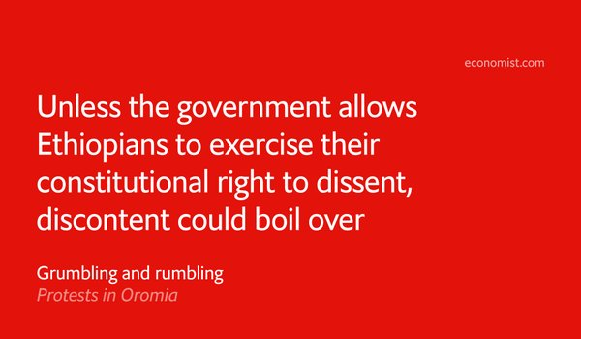 When the ruling Ethiopian People’s Revolutionary Democratic Front (EPRDF) extended the emergency law for another four months (albeit after watering down its most draconian provisions) on March 30th, it was because of places like Ambo. Hundreds of its citizens have been arrested and subjected to months of “re-education” in military camps. Although stability has more or less returned to Ethiopia there are still young men across Oromia and Amhara, the second-largest region, who talk of protesting once more when the state of emergency is eventually lifted. Not everyone feels this way. 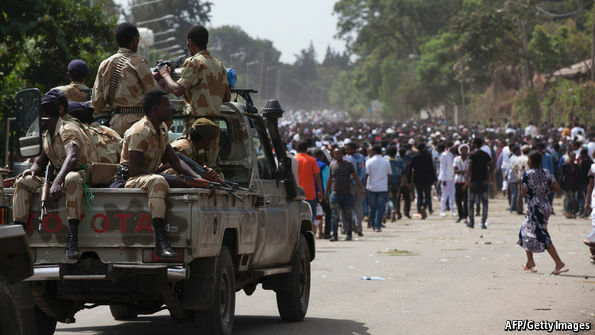 There may have been plenty of raised eyebrows when the prime minister, Hailemariam Desalegn, told Parliament on March 15th that 82% of Ethiopians wanted the state of emergency extended. But few want a return to disorder, and many admit that further emergency rule might not be so bad. Shopkeepers and restaurant owners in particular recall that businesses—as well as schools—were closed for months during the unrest. “Peace and security is more valuable than anything,” says a weary pharmacist. Yet the challenge of addressing both the frustrations of angry youngsters and the concerns of anxious property owners is one the EPRDF is struggling to solve. Ethiopia’s economy is still growing at a healthy 7% a year, one of the fastest rates in Africa, even though drought has again hit large parts of the country. Foreign investment, which the government is promoting energetically, has held up surprisingly well. But with political freedom now a thing of the past, the government’s legitimacy rests on it delivering the prosperity it has long promised to all its citizens. Political reform has been much less of a priority. Only one regional president has lost his job, though many ought to shoulder quite a bit of the blame for the unrest because of poor governance. A cabinet reshuffle in November included some high-profile changes: an Oromo controls the foreign ministry for the first time, for instance. But dialogue with opposition parties has made little progress. They must still ask permission to give a press conference or hold a public meeting. And an expansive anti-terrorism law, which has crimped their activities since 2009, will still be in place even when the last of the emergency provisions are lifted. The government has long promised to tackle corruption, which is the cause of much unhappiness. But there have been no high level prosecutions since October, even though tens of thousands of low-level officials have been sacked. “House of cards” is also an expression that dates back to 1645 meaning a structure or argument built on a shaky foundation or one that will collapse if a necessary (but possibly overlooked or unappreciated) element is removed.